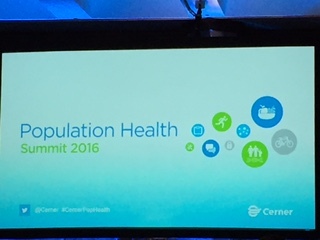 Last week, I attended the 3rd Population Health Summit hosted by Cerner in Kansas City. The event certainly has grown in size and maturity since I attended the inaugural event two summers ago. This time around there were 110 organizations, 33 states, and 5 countries represented among the attendees along with a larger venue to host a crowd which had more than doubled in size. Clearly, PHM has moved from the fringe to more center-stage. • Increasing emphasis on social and behavioral factors but uncertainty abounds: More emphasis in being placed on capturing a broader set of non-clinical information on patients and how this might affect a patient’s risk level and care plan outcomes. This is a topic we covered in detail in our latest Insight Report: Total Active Risk Management. The difficulty lies though in that there is no standardized set or methodology to capture, record, and exchange this information with other providers yet and subsequently gain insights that will optimize care processes. Besides using the PHQ-2 or PHQ-9 as a part of the health assessment to screen for depression or limited questions around the hospital discharge planning process, there still does not seem to be any significant activity occurring yet in this area, though there is strong interest. • Longitudinal care plans begins to take center stage: John Glaser, SVP of Population Health Management, gave his keynote address on Tuesday afternoon. Two of his key themes were: the medical record is transitioning to a plan and it is moving from a transaction-oriented record to one that is information-oriented. This is a fairly profound statement and one that all EHR vendors will struggle to address. The longitudinal care plan is something we wrote about extensively last year in our Insight Report on the topic. It was not surprising to hear Glaser highlight this topic as a key staple of provider-led care management but it was very interesting to see a leading EHR vendor put it front and center as a key core staple even if a fully-operationalized version is at least 3-4 years away. • Everybody has their own recipe: Cerner touted their partnership with xG Health Solutions as adding significant ‘off-the-shelf’ clinical content and rules for several applications on the HealtheIntent platform including HealtheCare and HealtheRegistries. This is an important issue especially for HCOs that want to get up and running quickly with their care management program. Just as every Italian family (including mine) seemingly has their own twist on making tomato sauce, a number of HCOs mentioned how important it is to then take this pre-packaged content and tailor it though to achieve greater physician buy-in and adoption making it relevant to the populations they serve. • Wrapping services around the technology: Cerner already has several advisory service offerings available to their clients but has emphasized the need to wrap a much broader set of offerings around them in the near future. Besides the possible revenue opportunities, this is a point we are increasingly seeing come up from vendors touting PHM-enabling solutions as they increasingly are talking about how they help their clients not only implement the solutions but how to optimize them most effectively to enable them to meet their broader organizational objectives. The question is: do these vendors provide the services directly or partner with others to deliver such services? Increasingly, it appears that vendors such as Cerner are picking the former with the desire to take a bigger piece of the services pie. • There is no ROI – Yet: If there was one question that was repeated time and time again at this event especially from the providers, it was how do you calculate and measure the ROI of the initial investments that providers are making in their care management organizations and efforts. Almost every provider organization that presented or I talked to acknowledged that their care management program was running in the red. In some cases, it was quite significantly in the red especially if they had just got the program up-and-running over the past year including hiring a number of additional FTEs to staff it. Providers apparently are not as focused on the bottom line right now with the assumption that if the care plan goals are being met in a timely fashion that there should be positive downstream effects at some point from a utilization, quality, and satisfaction (provider and patient) standpoint. While this does seem reasonable and the move to value-based care and bundled payments seems to support this thesis, it remains to be seen as to exactly when that ROI materializes. The few HCOs I spoke with seemed to hope that there would be a positive ROI within 3-5 years of launching their provider-led care management program but acknowledged it greatly depended upon how they calculated ROI. Most HCOs at the Population Health Summit are in the early phases of deploying the HealtheIntent platform (e.g., HealtheRecord, HealtheRegistries, and HealtheCare) especially the care management module. As a result, they are still either getting up running or fine-tuning for their particular PHM initiatives. It is not surprising then that providers have yet to see a positive ROI from these early efforts, which are only utilized for a small percentage of their overall patient population. The most interesting development to me though at this event was the acknowledgement of the longitudinal care plan as a core tenet of their PHM efforts by a leading EHR vendor. This has several important implications not only for the HealtheIntent platform itself, especially the HealtheRecord and HealtheCare modules, but more broader implications as the health IT market is shifting from the EMR to other solutions that will be utilized to coordinate care and activities for patients. The question is how will the longitudinal care plan be operationalized across various applications, settings, and the extended care team especially the patient and their caregivers.